dunhill saffiano leather belt from the Cadogan Collection. Golden-plated brass slider plaque with logo. Please note: Belt comes in one size and has been designed to be cut to the exact lengthso that you have a belt that has been specially and uniquely fitted to you, rather than having to buy a belt that is only approximately the right length. The belt strap is simple to cut with a sharp pair of scissors. To ensure that you cut it to the right length, you can either measure yourself around the waist, or measure the belt that you normally wear from the end of the strap by the buckle to the hole normally use. To remove the strap, release the mechanism on the back of the buckle and measure the same length on the strap of the new beltmake sure you do this from the center hole, or the one you prefer to use, to the end where the buckle fits. Always cut the belt a little longer than you measuredthis will allow you to make further adjustments when you try it on for size. For in-store inquiries, use sku #2160243. Berluti belt in reversible scritto-embossed calf leather. Silvertone logo-engraved square buckle. Approx. 1.4"W (35mm). Adjustable fit. Made in Italy. Berluti "Versatile" belt in reversible Venezia and classic box calf leather. Silvertone logo-engraved square buckle. Approx. 1.4"W (35mm). Adjustable fit. 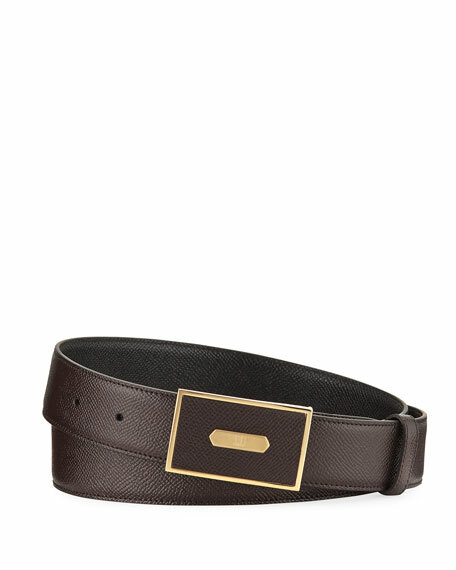 Ermenegildo Zegna belt reverses from grained to smooth leather. Silvertone rectangular buckle with engraved logo. Five-hold stud adjustment. Approx. 1.4"W.